"No Elections on 26th October, we will hold a mother of all Demonstration." 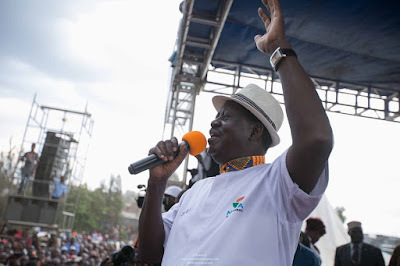 Says Raila Odinga - Bana Kenya News, Real African Network Tubanane. Raila Odinga has issued a statement following a stern warning from President Uhuru Kenyatta who that the elections will proceed as planned. Raila Odinga said that the elections day will hold a mother of all the demonstrations that have happened in the Jubilee regime. The NASA coalitions already have plans of feeding their demonstrators as water, food, Soda will be given to all demonstrators. He stated that the opposition’s “No reforms, No election” campaign would henceforth change to “No election on October 26,” adding that they would continue pushing the electoral body to meet NASA’s demands. On the resignation of IEBC commissioner Roselyn Akombe, Odinga said it was an indication that State House had been meddling in operations at the electoral body. He further stated that IEBC Chairman Wafula Chebukati had already given an indication that the repeat election would not happen, following remarks he (Chebukati) made during a press address on Wednesday, October 18. Addressing the media after Dr. Akombe’s resignation, Chebukati said he cannot guarantee the credibility of the October 26 repeat presidential election under the current conditions and with a divided commission. “I have made several attempts to make crucial changes, but all my emotions have been defeated by a majority of the commissioners. Under such conditions, it is difficult to guarantee free, fair and credible elections,” Chebukati said. The Siaya Senator James Orengo will be at the forefront for making sure that Kenya has liberated and the government goons will be dealt with. Raila Odinga and his team will hold a parallel rally with the Mashujaa day celebrations. He said that attending the Central region Mashujaa day will be wasting time rather than having a national day.